Kathnmandu--Third edition of Nepal-Bangladesh Business Forum (NBBF) is sell set to begin on Thursday i.e. March 28. The NBBF has been proved a best platform for promoting and strengthening bilateral cooperation between two crucial members of South Asian Association for Regional Cooperation (SAARC). 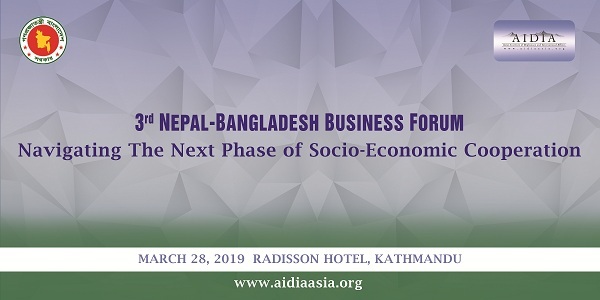 A joint endeavor of Kathmandu-based think tank Asian Institute of Diplomacy and International Affairs (AIDIA) and Embassy of Bangladesh in Kathmandu, the theme of NBBF this year is ‘Navigating the Next Phase of Socioeconomic Cooperation.’ The 3rd NBBF focuses on two major issues; strengthening media cooperation and expanding multimodal connectivity. Minister for Energy, Water Resources and Irrigation Barsha Man Pun will be the chief gust of the program. Other prominent guests are Former Minister for Communication and Technology Mohan Bahadur Basent, Ambassador of Bangladesh to Nepal Mashfee Binte Shams, Secretary at Ministry of Physical Infrastructure and Transport Madhusudan Adhikari, Former Foreign Secretary Madhu Raman Acharya, Deputy Director General, Development Cooperation Implementation Division (DCID), Department of Road Keshab Kumar Sharma, Spokesperson Bibeksheel Sajha Party Dr. Surya Raj Acharya, Chief Economist, International Centre for Integrated Mountain Development (ICIMOD) Golam Rasul, Laxman Bahadur Basnet, Former Executive Director, Nepal Intermodal Transport Development Board (NITDB) Editor-in-chief of Kantipur Narayan Wagle, Editor-in-chief of New Business Age Madan Lamsal and Editor-in-Chief, Daily Sun, Bangladesh Enamul Hoque Chowdhury. “In-depth and on-the-spot media coverage will promote the better understanding of the matters of mutual bilateral concern and there are ample of such common concerns between Nepal and Bangladesh,” said Founder and CEO of AIDIA Sunil KC said. “The 3rd NBBF intends to hold the intense discourse involving policymakers and government officials, business executives, media practitioners, scholars, academicians among others,” he added. Economic and commercial cooperation between two countries is growing over the years. This is high potential for expanding and diversifying economic and trade relation between two countries. There is a huge potential between two countries on energy cooperation. On August last year, two countries signed a cooperation agreement in the energy sector which paves the way for the export of electricity. Moreover, media cooperation between Nepal and Bangladesh is vital for fostering trade and economic relations, strengthening transport and energy connectivity, promoting tourism, educational collaboration and people-to-people contact, enhancing bilateral cooperation in common platforms like SAARC, BIMSTEC, BBIN , exchanging the respective climate policy paradigms (CPPs) among others.